It’s that time again! The Grand Prix events are over save the final and that means that we’ve seen most of the programs for this season! I have to say, I’m very impressed with the programs this season as the skaters have stepped it up to bring their A-game to the Olympics. I’ll start off the post with a special mention since there’s usually a picture after this introduction blurb. The special mention goes to Nelli Zhiganshina & Alexander Gazsi for their programs – both the SD and FD. In terms of choreography, they’re nothing remarkable but there’s something unique about taking the storyline of the SD and continuing in the FD. I think this team knew they probably weren’t going to win a lot of important events but I’m glad they took this creative risk. Kudos for that! This program does feel a little front-heavy but this clean performance and Daisuke’s commitment to the program shines through and by the time he does his step sequence, I forget all about that. After a year of disappointing programs and performances by Daisuke, this was a breath of fresh air and I’m glad this program shows off what he does best: his musicality and expression. That crisp quad toe and triple axel definitely helped the flow of this program as well. None of the men’s programs really stood out for me in terms of choreography but I did like the light and airy quality of this program and how Yan was able to carry it out. Special mention: Han Yan’s short program. I didn’t know that he was capable of such edginess. I swear his movements and expression were almost Daisuke-esque. I can’t tell you how impressed I was with this program and this young lady when I first saw her skate this at the Nebelhorn Trophy. Just, wow. You can see just how much power and edge control she has within the first minute and it’s hard to believe that a 14 year-old can carry this music right until the end. You can’t take your eyes off her and this isn’t easy music to skate to. Subdued, quiet and yet very elegant, Elena skates to this music with a quiet strength that belies her age. What I love about this program is how the elements are woven in seamlessly and you forget you’re watching a program choreographed to gain points from judges. I seriously watched and re-watched this program after I found it and I hope you enjoy as much as I do. Mao hasn’t skated this program perfectly this season but I love this program because it shows off the best of Mao: the talent and the growth. 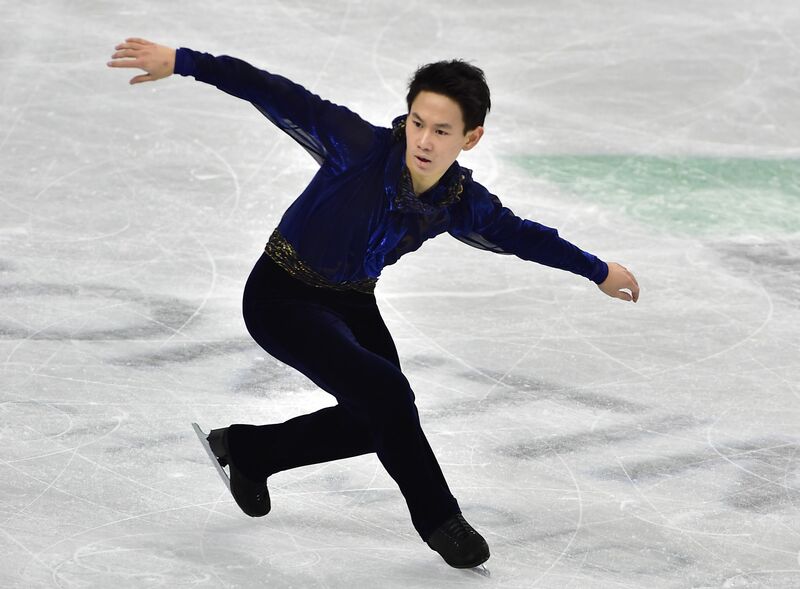 The elements flow well into each other and there are all these complicated transitions that Mao does as if they were child’s play – the pseudo-spin into the camel spin, the footwork into the 3F at the beginning… Mao skates them as smooth as butter. There’s a strength and athleticism from her that we haven’t seen as much before and you can just see that her crossovers and strokes carry her faster and farther. Mao’s also shown that her musicality has improved- that upper body movement in the first three seconds and the darker tone of the music are expressed a lot better and without any awkwardness like in her “Bells of Moscow” LP in Vancouver. Mao’s journey has been one of growth and improvement and I wish her the very best this season. The thing about this program is that if you break it down into its elements, you can see that “checklist” of required elements. There aren’t that many transitions between the elements and quite a bit of forward two-foot skating. However, this program is unusual in that a lot of elements (i.e. the death spiral, pairs spin) aren’t left to the end as they usually are and for a relatively new team, the music was one of those more subdued pieces and therefore, more difficult to pull off without losing the audience’s attention. What really makes this program shine is the connection that exists the two partners despite the vast age difference and the long flowing lines in the choreography that fits the music very well. For a team that has yet to reach the highest level of skating, this simpler program dazzles with the chemistry between the two partners, very well-executed elements and well thought-out choreography that suits the music and the skaters. I tried, really, I did, to find another pairs LP I liked better but I couldn’t. I think the reason I like this team and their choreography is because they remind me of pairs skating at its best: elegance, chemistry and big tricks. Here we have another program skated to subdued music but you’re mesmerized by their flow and carriage across the ice. That quad twist was just amazing as well. I seriously hope these two can somehow get to the Olympics. Yes, I’ll admit to liking this. Even if the music is overused. And there’s a few pauses in the choreography. And even if Morozov probably choreographed it. Now excuse me while I wallow in shame. What were your favourite programs from this season? Let me know! Also, I’ll be coming up with a favourite costumes post soon as well!